Premier constructeur Deutsche Forschungsanstalt für Segelflug E.V. Histoire résumée The Meise, designed by Hans Jacobs of the Deutches Forschunginstitut fur Segelflug ( German Research Institute for Soaring Flight )(D.F.S. 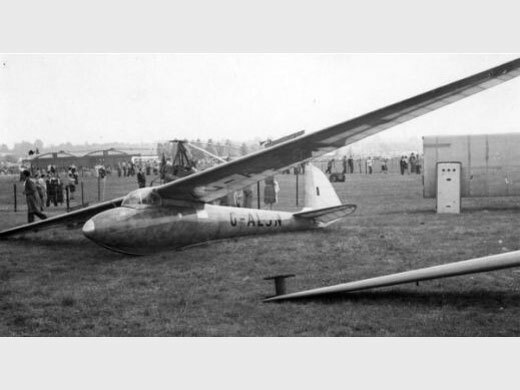 ), won the contest to be the standard type to be used in soaring competition at the 1940 Olympic Games planned for Helsinki, Finland, hence the name Olymplia, Plans were distributed throughout the world for competing nations to produce their own Olympias. World War II prevented the Games taking place but the design was widely produced in Germany and elsewhere. Approach control is by top and bottom Surface Schemmpp-Hirth type airbrakes. The original version uses a takeoff dolly. Olypias were manufactured in France by Nord with the name Nord 2000. In Britain, Elliotts of Newbury produced ( as the EoN Type 5 ) the original skid version, and a modified version ( Olympia 2B) with non-retractable main wheel. 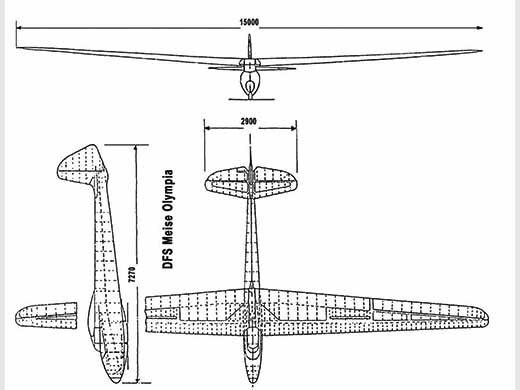 The Vintage Sailplane Association has plans. Immatriculé : HB-384 (En état de vol), localisation inconnue. par ZUERL, Hubert (1941) [p. 16, 21, 23. Photo + mention]. par SCHNEIDER, Helmut (1944) [p. 268. Photo + specs]. par MARRAZA, Italo (1945) [p. 54. Specs]. par KAWAKAMI, H. (1998) [p. 309. Note + plan 3 vues + specs]. par SELINGER, Peter F. (2003) [p. 23. Note + photo]. par SIMONS, Martin (2001) [p. 128. Photo + mention]. par SELINGER, Peter F. (2004) [p. 90-91. Texte + 2 photos + specs]. par MURAWSKI, Tomasz (2015) [p. 55. Photo + dessin AF + plan 3 vues]. par De la BURGADE, Michel (2017) . Soaring mai 1960 p 18. Texte + Photo. A propos du Meise Olympique, Johannes Fischer, Lettre d'Information Dédale n° 102, été 2012 p 3-7. Inventaire des "Olympia" construits. Texte + 11 photos.